I’ve been fascinated that an actor in one of my favorite TV shows came out of the closet and in the process has made so much more of his life than basking in fame from previous endeavors. George Takei was certainly typecast as Mr Sulu, but his life has been anything but typecast. Synopsis: Together with his husband Brad, actor-activist George Takei parlays his remarkable acting career and wicked sense of humor into a new role as beloved pop-culture icon and Internet phenomenon. This documentary tells the story of George Takei from before his Star Trek days through coming out and his current life. I think it was both interesting and important for him to talk about the Japanese-American internment camps. So many people did not live through that time or see what happened, and it’s important that Americans know our own history. Even the parts that we’re not proud of. Especially that parts that we’re not proud of. He talked about how he got into show business and eventually into the Star Trek franchise. But we also see a personal side of him, especially with him and his husband Brad. Again, I see this not as groundbreaking in this day and age, but still very important. It’s good for young, gay folks to have role models and to see this side of life even for someone famous. 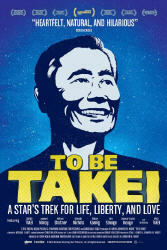 I admire George Takei for taking such a strong stand for marriage equality and speaking up for everyone when he can. I think that given his background, it’s not about the spotlight, but about doing what’s right. And I can always admire and respect that. The only thing I thought was a little out of place were the digs against William Shatner. I’m just not sure how this factors into Mr Takei’s life. Was their relationship (or lack thereof) formative or somehow affected his life in a way that isn’t really revealed? The documentary is well put together, well-paced, and production values are good. I rented this from iTunes for 99 cents – such a bargain! Well worth seeing the man behind the Facebook posts!